With a room full to bursting, the launch of Urban Geopolitics: Rethinking Planning in Contested Cities, edited by Jonathan Rokem (UCL Geography) and Camillo Boano (The Bartlett Development Planning Unit, UCL / Urban Lab), was clearly highly relevant to those studying, thinking, and researching contemporary urban studies. People lined up against the back wall, willing to put up with the lack of seating for a chance to hear some of the contributors give a brief presentation of their chapters. Afterwards, three guests were invited to give responses and their comments on the book. Jonathan and Camillo opened up the Urban Salon seminar with a brief introduction and explanation of how the book came to be. The selection of cities featured is very broad, departing from those that may have appeared in a similar book had it been published a few decades earlier. In total, a diverse selection of fifteen places are represented and broken up across a number of sections, including those on dualistic comparative urban geopolitics and then three sections in Southeast Asia, the Middle East, and Latin America. Each chapter focuses on a specific city, or two in the case of the comparisons to create an overarching framework. The introduction was written throughout the process of the book, making it an excellent snapshot of the entire process in order to understand how the featured cities have and are developed. The cities in this seminar – and those in the book – are analysed from a bottom-up approach, engaging with various issues and particulars from each place in order to create new theories, those not taken from the global north, but developed at the local and regional level in the south. This is important in opening up urban theory and debate to a wider audience, and creating new discourse with those who are not usually featured in the conversation. Furthermore, the book uses ‘geopolitics’ as a central argument amongst various disciplines such as urban studies, planning, politics, and cultural contexts. Chapter presentations included Sudaf Sultan Khan (The Bartlett School of Architecture, UCL) on Karachi in Pakistan, Pawda F. Tjoa (New Local Government Network) on Jakarta in Indonesia, Moriel Ram (UCL Institute of Advanced Studies) on Famagusta in Cyprus, and Catalina Ortiz (The Bartlett Development Planning Unit) on Medellín, Colombia. Each author brought with them their personal and academic understanding of the city, from the most detailed level, in order to fully appreciate the contestation and political developments that are ongoing. Following this, questions from the audience ranged from those on security in spaces, informality as creating disadvantaged communities, to planning strategies that could create a contested city. The whole night was not only informative, it was also entertaining and gave more than one reason to seek out the book. The breadth of research that is behind it and the range of voices featured is incredible. 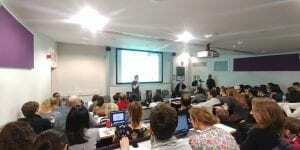 Fortunately, the whole session was recorded and available to listen to via the UCL Urban Laboratory’s SoundCloud page. • The book launch was hosted by the Urban Salon, with the financial support of UCL Urban Laboratory and The Bartlett Development Planning Unit, UCL.